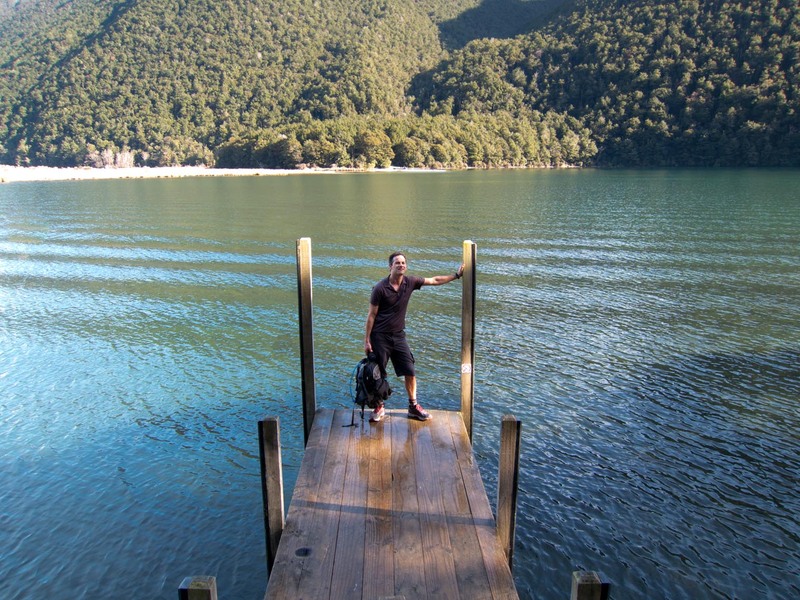 Nelson Lakes is an undeniably stunning area of the South Island, with the loop around Lake Rotoiti being an especially beautiful track. Mountain Biking in this area has always appealed so not long ago I took the chance to circumnavigate the lake. But, alas, not on the bike. Although mountain bikes have been trialed successfully on the Heaphy, for cyclists to enjoy tracks such as Lake Rotoiti we still have to ‘beat the feet’. Nonetheless, I was looking forward to the experience as we jogged off from Kerr Bay towards Lakehead Hut. The 8 kilometre ‘Round The Bays’ in Auckland had previously been my longest ever run. The Rotoiti circuit was 3 times the length so there was some trepidation as to how the legs would hold up. However, I soon forgot about my lack of fitness, loping along amidst birdsong and beautiful native bush with the cool blue waters of Rotoiti sparkling between the trees. An hour or so later we arrived at Lakehead Hut. Set on a grassy plain where the Travers River feeds the lake, it’s a wonderful spot. After enjoying a quick snack beneath the soaring 2000 metre peaks of the Travers Range it was time to jog on. It’s just a hop, skip and a jump from Lakehead to Coldwater Hut, which is just as well as the legs were beginning to protest. Coldwater Hut, backing onto the lake, benefits from a very serene setting. Well, it would have been serene had there not been half a dozen young Czechs relishing some cold beers. They’d caught a water taxi from the carpark, which at the time seemed a far more sensible way of getting to the south side of the lake. After bidding them farewell we carried on. The track, still in magnificent condition, continued beside the lake for a few more kilometres. We took a short diversion to the unremarkable Whiskey Falls, but by this stage we were both really starting to tire. Not for the first time did I wish I was on my mountain bike. The final stretch from West Bay to Kerr Bay seemed never-ending, and with my thoughts being solely of creature comforts it was with huge delight when our car eventually came into view. Whilst warming down and in between swatting sandflies and feeding our faces, I reflected on the excursion. The circuit makes for an outstanding run or hike, and with well-spaced huts it’s easy to tailor your schedule over more than one day. The more adventurous can also continue on and complete the renowned Travers-Sabine circuit, which takes 4-7 days, or head up to Angelus Hut for a night. At just over an hour’s drive from Nelson and Blenheim, the Nelson Lakes is a spectacular asset to the Top of the South. And one area you definitely don’t need a mountain bike for.